Several months ago, some of the guys in the office talked me into running a 10k race with them. Having never conquered a long distance run before, I had no idea what I signed up for. Ignorance is bliss…or blisters, as it were in my case. I became painfully aware that having the right equipment (aka top-of-the-line, proper fitting running shoes) is a vital factor in successfully completing a 10k – and living to blog about it. While it’s unlikely that I will ever run a 10k again, without a doubt the PSM10K High Volume model will run 10k reliably and regularly day after day without wearing out, unlike yours truly. I Feel the Need, the Need for Speed! Gosh, I love that movie! As quoted by the characters Maverick (Tom Cruise) and Goose (Anthony Edwards) in Top Gun, “I feel the need, the need for speed!” I will never tire of watching that movie. The Need for Speed is synonymous with the PSM10K. Seriously. How can you beat 10,000 documents per hour? With the PSM10K, you can add up to 500 sheets while the equipment is processing thanks to bottom feed technology. Due to its extra-long conveyor at 36”, the PSM10K easily accommodates the high output. As crazy as this might sound, just think of it as a Hemi engine. It’s powerful and muscular. Not bulky. It’s a fine looking piece of equipment that quietly sits on a desktop and churns out the mailers. With the power of the PSM10K, you’ll be surprised to know it only weighs 75 pounds. 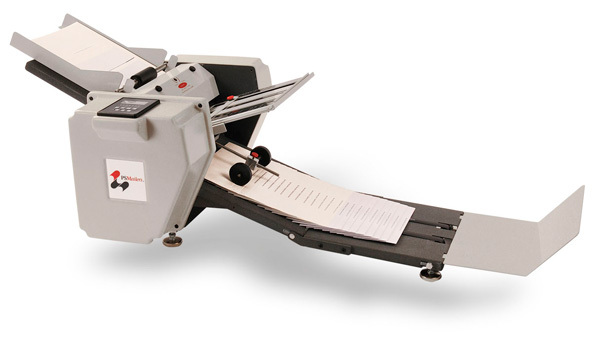 It processes sheets up to 8.5” x 14” and can produce five different folds: C, V, EZ, Z and EC. It has a manual fold plate, a digital counter and is a bottom-feeding system. A variable speed dial allows you to control the speed if it needs to be slowed temporarily....but don’t even think of it. Why harness the power and output?! Although it’s not the muscle car you’ve been dreaming of, the PSM10K will fulfill your need for speed, guaranteed! To request more information, visit the PSM10K Demonstration Page. And, don’t forget, PS Mailers are MADE IN THE USA! © 2014 PSMailers. All rights reserved.